If you are unable to attend, we will be live streaming this meeting to our Facebook page. You can comment during the meeting through Facebook. You can find us on Facebook as "Walden Woods One". But showing up in person will be much better as you'll be able to ask questions and provide input to the board, AND WE WILL BE HAVING REFRESHMENTS! You can find the Dues Policy, including non-payment penalties, in the NEWS section of our website. We are on Facebook! LIKE and FOLLOW our page to get the news feed we share. The news we share is related to social events, annual meetings, school and community current events, and voting. Corrigan Storage is located just around the corner from us (see map below). Corrigan Storage is offering to Novi residents the opportunity to recycle for a $5 charge NAID Certified Secured Shredding of up to 300 pounds of paper. The fee for all other forms of paper, over 300 pounds will be $.05 per pound, and hard drive destruction is available for a $5 fee. Corrigan will provide a Certificate of Destruction when requested. 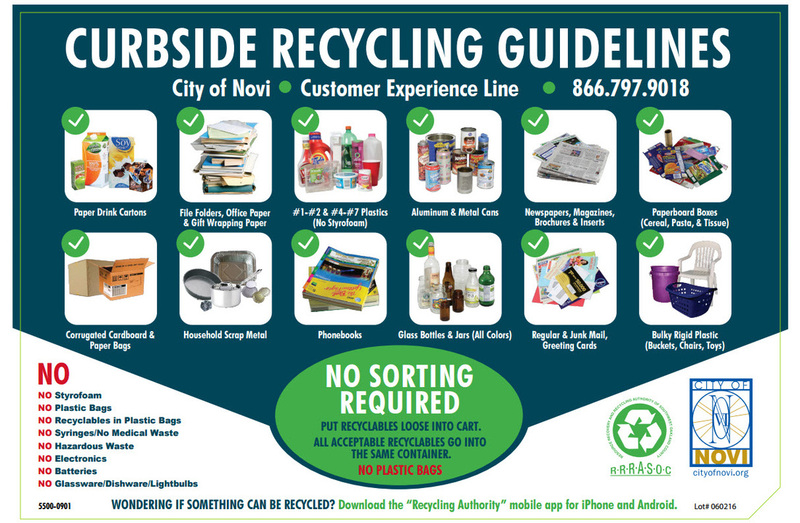 The City of Novi has a recycling center. You can drop off unsorted recyclables seven days a week! Read more details of this topic and others on our NEWS YOU CAN USE page. If mailbox repair work is required because it was hit by a car, truck, plow, etc. and you do not know who hit it, it is important that you work with your neighbors to determine the details that can be reported to the police and the board. Photos are strongly suggested if a third party or insurance claim is involved. If you know who hit the mailbox, please contact the party that hit the mailbox and a member of the board. Do you have a home improvement project planned for this year? (Most of us do!) There are two places on our website where you will find contractors that can help you with those projects. ​The plastic bags from the grocery store and retailers are NOT recyclable. Plastic bags should be recycled at your grocery store's recycling area. ​Household furniture, a mattress and box spring or a refrigerator are examples of bulk items that will be picked up at no additional cost. Call Waste Management at 866-797-9018 (7:30am to 5:30pm Monday through Friday) to schedule a pick up.